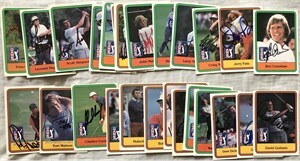 Lot of 31 different 1981 Donruss golf cards autographed in various pens: Tom Watson (regular and Stat Leader card), Lee Trevino (regular and Stat Leader card), Ben Crenshaw, Jerry Pate, Tom Kite, Craig Stadler, Ray Floyd, Larry Nelson, Howard Twitty, John Mahaffey, Doug Tewell, Don Pooley, Bob Gilder, Jim Colbert, Scott Simpson, Leonard Thompson, Peter Jacobsen, David Graham, Gil Morgan, Dave Eichelberger, Wayne Levi, Tom Purtzer, Jay Haas, Gibby Gilbert, Bob Murphy, Hubert Green, J.C. Snead, Charles Coody and Lanny Wadkins. 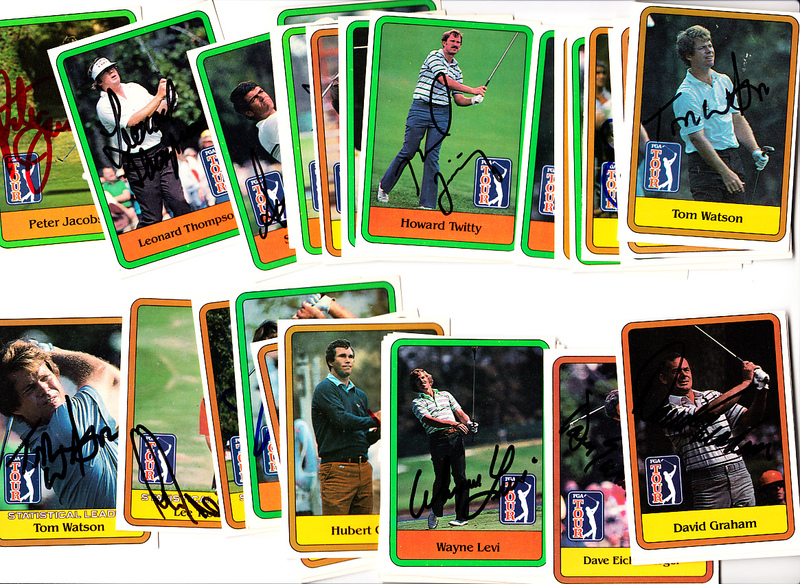 All autographs obtained in person at various PGA Tour and Champions Tour events, with certificate of authenticity from AutographsForSale.com. Cards average ExMt condition (mostly corner wear). All autographs obtained in person at various PGA Tour and Champions Tour events, with certificate of authenticity from AutographsForSale.com. Cards average ExMt condition (mostly corner wear). ONLY ONE LOT AVAILABLE FOR SALE.